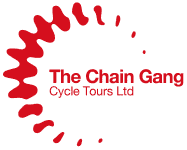 The Chain Gang specializes in bike tours in France, Italy and the UK. All of our tours are in beautiful regions, and wherever we’re cycling we make sure we explore the best of the local scenery, as well as the best of the history and the cuisine of the region. The Chain Gang was established in 1997, and the relationships we’ve developed with our hotel and restaurant partners mean that you’ll be looked after whichever tour you choose. All you have to do is remember to enjoy your cycling! A Guided Bike Tour Through The Loire Valley. Bike tour in Tuscany, Italy.